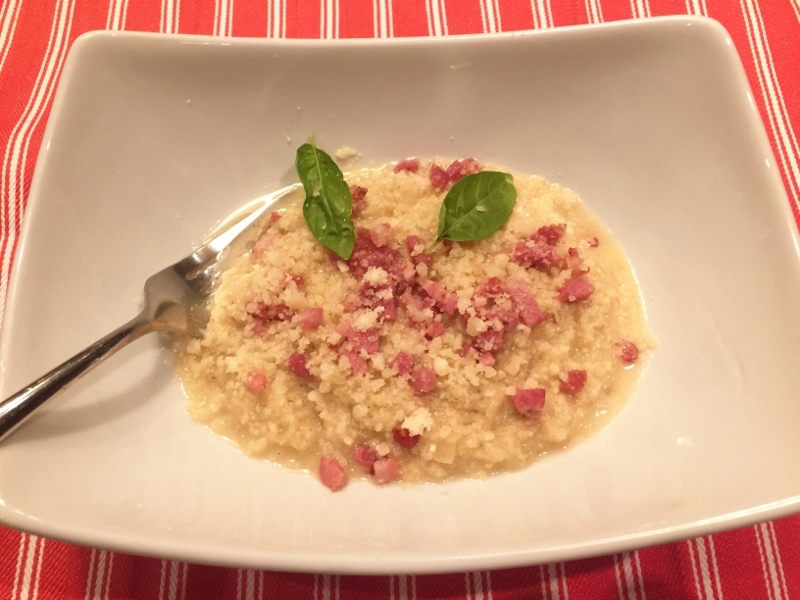 Cauliflower Risotto with Pancetta & Parmesan - Recipe! - Live. Love. Laugh. Food. 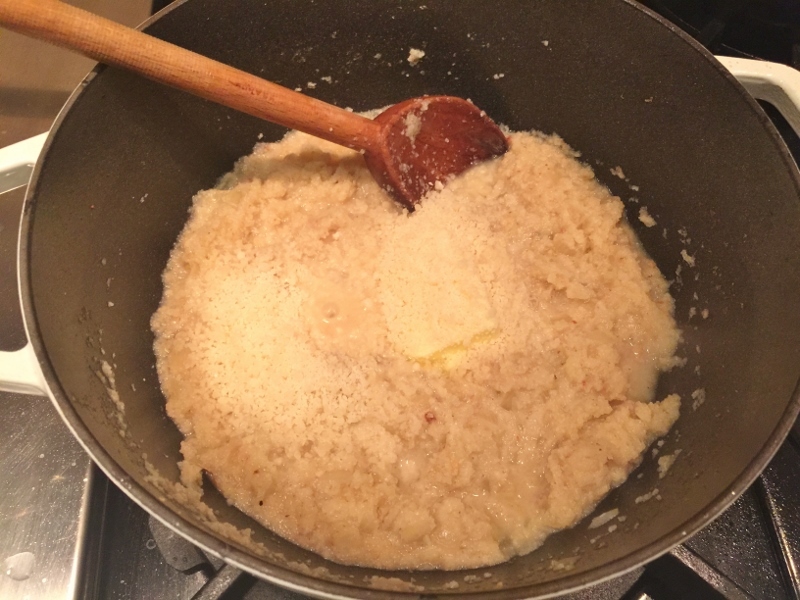 Cauliflower Risotto with Pancetta & Parmesan – Recipe! 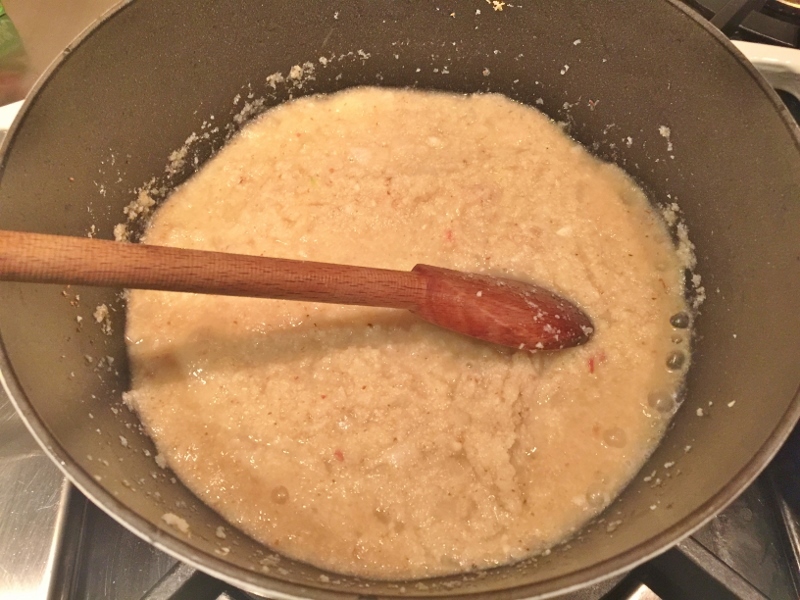 Riced Cauliflower has been all the rage for a year now and you don’t even have to pulverize your own, you can buy it already done in the grocery store. 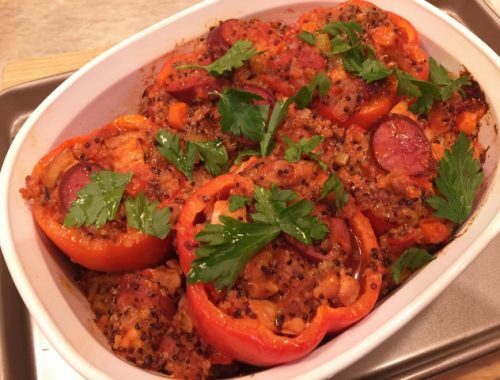 The tender grains of vegetable make it an easy meal to prepare because it cooks up so quickly because of its size. Risotto is always a comforting food – tender and warm with a nice chew. However, sometimes it’s nice to use cauliflower instead because its much healthier, less of a carbohydrate load and has a nice nutty taste. Riced Cauliflower is the new Arborio! The little pieces of cauliflower soak up the broth and other ingredients like a sponge and become super tender and creamy. 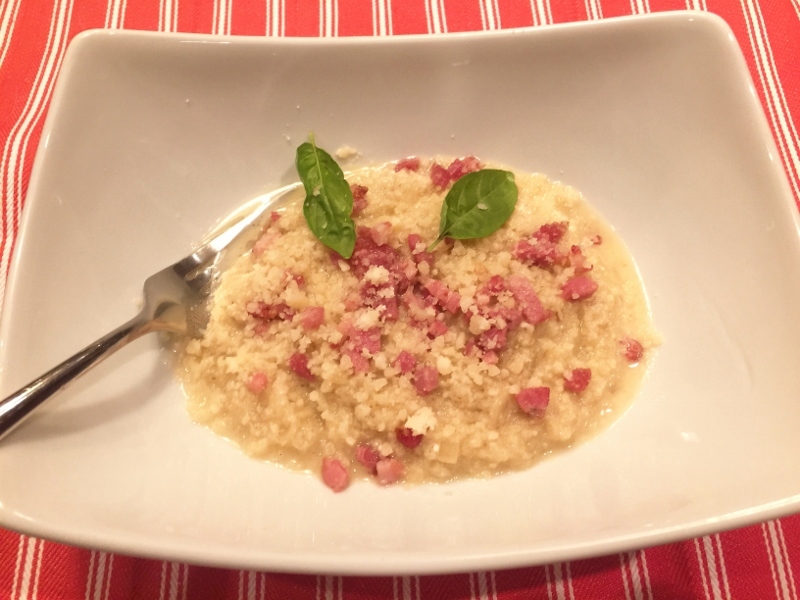 In this recipe for Cauliflower Risotto with Pancetta & Parmesan I use Italian cured ham to enhance the flavors into something that Mama Gina might even prepare. The entire bowl is steamy, delicate on your palate and something I guarantee you will make again and again. 1. 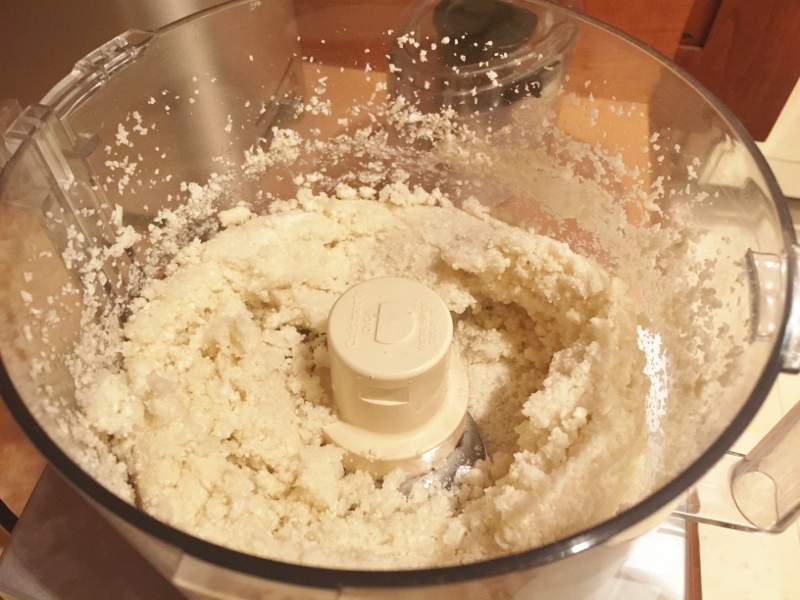 Pulverize cauliflower in a food processor until it is a fine grain. Dice onion and set aside. 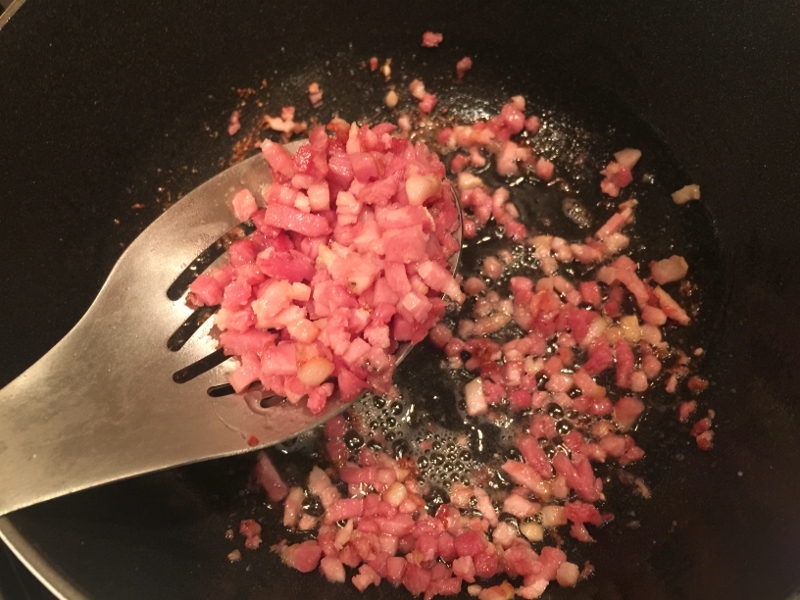 In a large pot or dutch oven, add pancetta and cook until crispy, remove to a bowl with slotted spoon. 2. Add cauliflower and onion to the pot with the pancetta drippings. Add 2 teaspoons of olive oil, 1/2 teaspoon salt and 1/4 teaspoon pepper on top and stir. 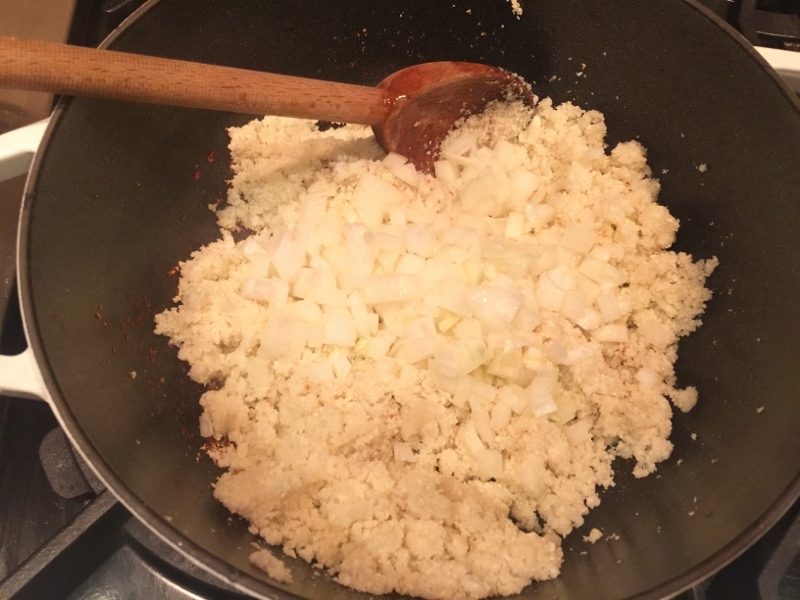 Cook over medium-low heat to remove the raw taste of cauliflower and tenderize the onion, about 5 minutes. Turn the heat to medium and pour in 1/2 cup of broth and continue to cook for 4 minutes. When the broth is mostly absorbed, add another 1/2 cup broth, cook 4 minutes – repeat 2 more times. 3. When the risotto is creamy and tender, add the butter and 1/4 cup parmesan cheese. Stir until melted into the risotto. Ladle the risotto into bowls and top with crispy pancetta and a dusting of remaining parmesan cheese. Enjoy! 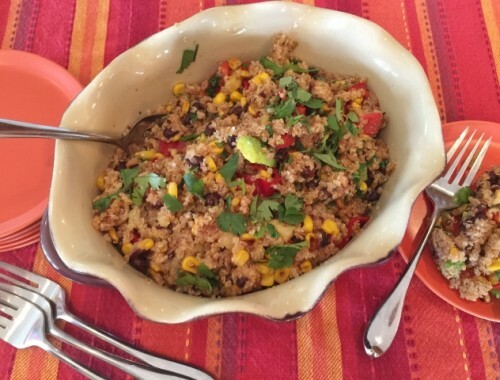 Late Summer Quinoa Salad Recipe from The EveryGirl’s Guide to Cooking by Maria Menounos! 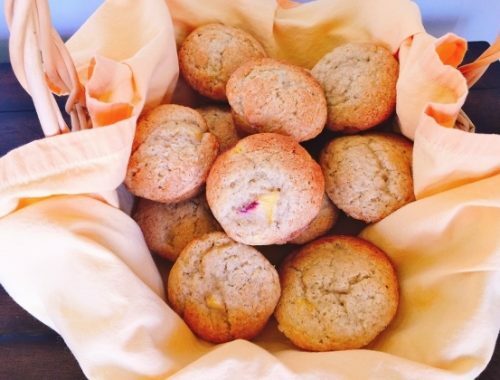 Peach Buttermilk Muffins – Recipe!